Burlington-Edison High School is home to many amazing teams, clubs, and programs, but of those, unified basketball stands out. This team is competitive, athletic, and more importantly inclusive and open-minded. Unified basketball revolves around having a good time. Everybody involved in this program - players, coaches, fans, and referees - benefit from it. For those who don’t know, unified basketball is a sport where kids who are impacted by a disability play basketball alongside their non-disabled peers. Often times, kids with disabilities get left out and don’t have many opportunities to get involved. Unified basketball is special for these athletes because it gives them the chance to be part of a team. Like other sports, unified basketball is competitive and always ends with a win or a loss. Instead of letting the competitive nature take away from the game, the players use the competition to bring more joy into playing. That’s the main difference between it and other sports, the players never cease to have fun. You can tell by simply looking at their faces. Throughout the game every single player on the court has an authentic grin, contagious to all who watch. Another positive aspect of unified basketball, is how it brings schools together. In other sports schools are generally cheering against each other, with the main goal being to win. In unified the main goal is to be inclusive, so instead of cheering for or against a specific school, everyone is cheering for both teams. Any time an athlete makes a basket, the whole crowd goes wild. The players who make the basket love the support, and will get super hyped, throwing fist pumps into the air, and giving high fives all around. 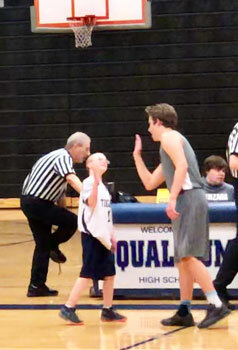 Unified is so inclusive that even the other team will give a high five after a successful shot or a great pass. Every school does something to make each game special. Mariner High School brought their full band, dance team, and cheerleaders. At Burlington-Edison High School, alongside the band and the cheerleaders, you’ll hear the Life Skills teacher, Steve Clark, making play by play commentary. Mr. Clark has a background in theatre, making his commentary colorful and enthusiastic. If that’s not enough, all of the athletes are in his class so he knows details about them, making his commentary greatly appreciated. At the start of the game Mr.Clark will announce both teams, assigning a special nickname for the Burlington players. The athletes absolutely love Mr. Clark’s announcing, which makes them even more excited to hit the court. 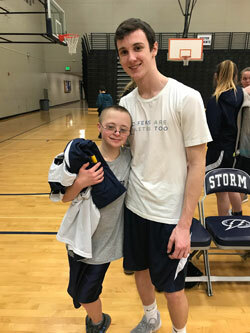 Unified basketball has helped to bring peer involvement with the Life-Skills students. There has been a school wide increase of participation in P.E. peer tutoring, classroom peer tutoring, and other unified sports. The choir and cheerleaders have happily accepted the participation of Life-Skills students in their respective clubs. All of this has created an overall more inclusive environment at B-EHS. Our goal for this year is to start the tradition of a unified basketball spirit game, with another school. We think that if we do so, and bring in a lot of students to support us, the players will be absolutely ecstatic. Getting massive amounts of high schoolers to come to the game would be meaningful to both the players and those who watch which is why we are trying to acquire a spirit game. There aren’t many other schools with unified sports, but unified has been on the rise. 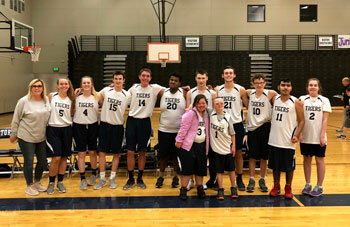 If you don’t have one, talk to your athletic director and see what you can do to get one because having a unified basketball team can be a great boost for school spirit and inclusiveness.